As Breitbart Texas previously reported, South Texas Congressman Ruben Hinojosa is one of four Texas politicians out of a total of 10 being investigated for ethics violations in connection with a $750,000 all expense trip to the Caspian Sea secretly paid for by the government of Azerbaijan through their state run oil company SOCAR and a series of non-profit corporation in the US. In addition to the trip, the politicians are said to have received hundreds of thousands of dollars in gifts in a move that raises the question if the trip was an effort to illegally influence U.S. policy. The Monitor, the leading newspaper in South Texas, has called out Hinojosa in their most recent editorial piece and demanded answers about what possible value could Azerbaijan relations have for South Texas. They pointed out that Hinojosa and his wife’s airfare were the most expensive of all. Hinojosa’s trip has drawn criticism from two of his rivals in the upcoming 2016 elections. “When you have been an elected official for 18 years and you can’t differentiate between right and wrong, it is time to move on. He should have known better.” said Paul Williams, a combat veteran U.S. Marine who is a full-time police officer and a martial arts instructor. Williams is running against Hinojosa as a Democrat in the party’s primary election. The issue of taking gifts would raise flags in many professions. William’s, who is a police officer in Mission, Texas, said the same standard that law enforcement is held to should apply to Hinojosa and the other 9 politicians. The mere impression of a cop taking a gratuity is enough to warrant reprimands, suspension and full investigation to determine if there is any criminal culpability. Hinojosa’s Republican rival, Former Rio Grande City Mayor Ruben Villarreal, has also voiced out his outrage at the trip and the unanswered questions. As a veteran congressman Hinojosa should have known that nothing is free and gifts come with a certain expectation of reciprocity, Villarreal said. “He’s not fooling anyone. Anyone with common sense can see that,” he said. 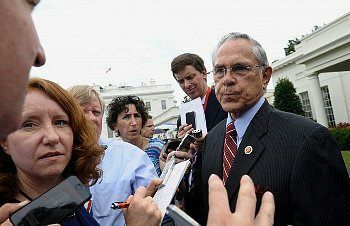 Prior to the trip to Azerbaijan and Turkey, I sought approval from the U.S. House Committee on Ethics to travel. On May 23, 2013, the Committee approved travel for my spouse and I to visit Azerbaijan and Turkey. I relied upon this written authorization in deciding to travel overseas. I believed the purpose of the trip was to strengthen U.S.-Turkey and U.S.-Azerbaijani relations. I received souvenirs of what I believed to be of minimal value and in compliance with the House Gift rule. Almost a year after the trip, I learned that an investigation was being conducted into the funding source of this trip. My staff and I have fully cooperated with the investigation. Importantly, the report notes that there is no evidence to suggest that Members of Congress who went on the trip knew that impermissible sponsors and organizers may have been involved and that Members relied on the sponsors’ representations in good faith. I look forward to this issue being resolved in an expeditious manner and I thank the Office of Congressional Ethics and the Committee on Ethics for their professionalism.